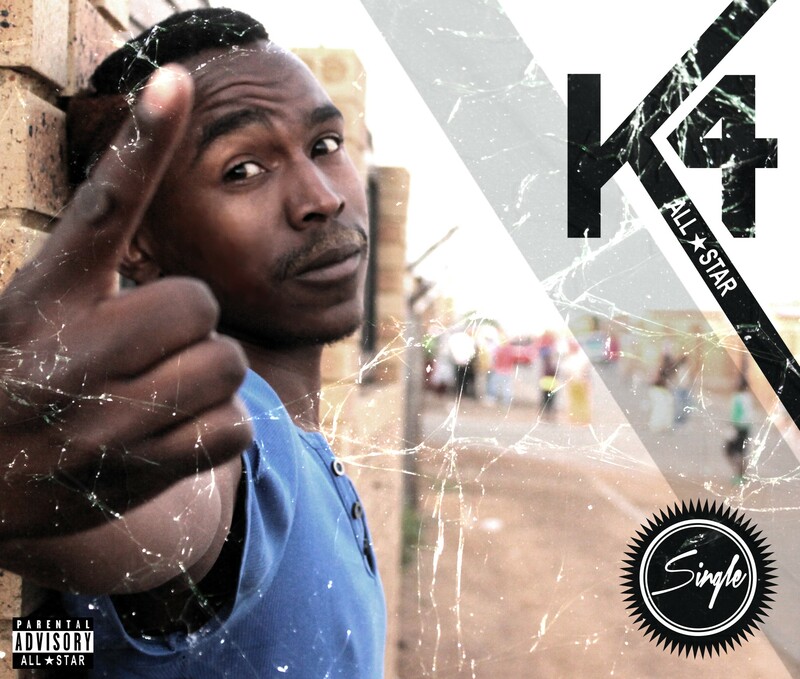 Profile: Sowetan Kasi-Rap Pioneer Taolo “K4″‘s biography and upcoming album. South African born and Soweto bred; K4 is a talented musician who practices the skill of rhyming in vernacular rap called “Kasirap”. Kasirap encompasses various elements from various backgrounds, it involves street talk and highly influential messages in Zulu, English and other languages, yet with a largely comprehended lingo, K4 brings a different flavour & sound not only to this type of music but also to the hip-hop scene. One of K4’s objectives is to encourage & inspire international appeal into South African music broadly. K4 might be new to the industry but he is definitely not new to hip-hop, he has released 2 mix tapes for performances and internet use only. K4 has an up & coming album coming out this year. K4’s 1st mix tape offering titled “Music, Pain & Success was released in late 2012; now on this project he brings a distinctive sound and formula. The concept is about to bring back the show, the energy, creativity, stage, lights and quality performance that is out of the ordinary. The project had already received a positive reception locally & via downloads on multiple internet sites. His 2nd offering titled “IMPETHA” also had a massive response plus his 1st single titled “IKASI LAMI” with “JABAVU BOYZ, CHERRILANE & SCASHO” had already been dominating the air waves on SOWETOTV CHANNEL 251 on Dstv [STREET RADIO & KASIVIBE]. He has worked with a lot of multi-talented known and unknown artists & producers in Soweto, Roodepoort & Kagiso the likes of TIMZAPRO, FACE, KINGVERTICE, G-MAX, TONA 12DEGREEZ, SPEEKA & TRAE J. WATTS just to name a few. K4’s 2 singles from both mix tapes titled “TOWNSHIP LEGACY” & “IKASI LAMI” have videos on YouTube. K4 is a multi-talented musician with an ability to play instruments like bass guitar, lead guitar & a double bass. K4’s real name is Jeremiah Neggie Nkotsi also known as “TAOLO” by his Setswana name given by his grandmother. He got his aka “K4” from his peers calling by all the names that could describe a guy with a big head namely [KOP, MAKHANDA ,JOMO & SKOPO] and then as creative as he is “K4” is an abbreviation of “KING KOP KHANDA KHULU” rather. K4 owns and runs a record company & an organization for youth social development structures in Jabavu. K4’s favourite local artists are KO, PRO, SIYA SHEZI & KWESTA. Before releasing his 2nd tape he was rejected by 2 record labels & ever since K4 has always been an in depended multitalented artist. The biggest highlight of K4’s career was when his 1st single from his 2nd tape “IKASI LAMI” got massive airplay on Soweto TV channel 251 it was on the #1 spot for 2 weeks on Street Radio and Kasi Vibe. K4 is one of the so called kasirap pioneers following the likes of PRO, F-EAZY, SIYA SHEZI, DEEP SOWETO & MASEVEN just to name a few. K4 worked with Dj Ohza [KALAWA JAZZMEE], DRENCKO a former Ghetto Ruff recording artist & Menzi [H2O] of the “It’s wonderful” sensation. K4 would like to work & collaborate with BIRDMAN, because he once gave a solid advice to up & coming artists he quotes: Artists should start making studios their streets, rather than standing on the corners all day & wasting productive time. K4 was a guest & a participant on CULA S’BONE show on mzansi magic. K4 dropped 2 mixtapes both accompanied by videos. K4 will be dropping an album this year titled “MY TESTIMONY”. If K4 was not a musician he would be a music teacher or a journalist. Next Post Profile: Upcoming Kwaito Star sensation Lebogang “Tshasaboi” from Soweto.